In my mind, there is no worse adjective in football than grinta (grit). I have always read it as a euphemism, or something that only the English national football team used to be proud of having up until the mid-noughties (alongside its almost-as-ugly cousin, determination). It says without saying explicitly that your grinta is always compensating for your lack of qualita (quality). Sure, you can have it in addition to some other trait. As a supplement, it is desirable even. But bestowed on its own it's practically a pejorative. Milan coach Gennaro Gattuso may not take it that way because he epitomized it throughout his career. His nickname is Ringhio, or Snarl, after all. But it would be reductive to characterize all of the outstanding work he is doing at Milan as an extension of his grit, a simple byproduct of his perpetually elevated voice and heart-rate. There is method here. There is geometry. There is psychology. Milan didn't sweep aside Roma on Sunday at the Stadio Olimpico for the first time in seven years because of Gattuso's tub-thumping. They did it after playing a classic Serie A game. They lay in ambush in the first half, absorbing Roma's ultimately meaningless pressure with relative ease. Then they came out in the second half and moved the ball throughout their team and took two wonderful goals when they needed to. They used width. They used the touchline like a tightrope. I lost count of how many times Franck Kessie picked up the ball right on the line; how many times long balls found their target. Consider the first goal: it came from Ricardo Rodriguez's long ball to Kessie who headed it down for Patrick Cutrone, who passed it to Suso, who returned the favour with a looping ball that Cutrone touched in. It was a goal similar to the one against Sampdoria last week in that it started with a precise long ball. Last week it was Hakan Calhanoglu; this week, Rodriguez. Then there is the revival of Leonardo Bonucci, who is finally playing with the presence and leadership that Milan fans had wanted. Alongside Alessio Romagnoli, whose reading of the game is impeccable currently, he forms what could be the best central defensive partnership in Serie A. Together, they have managed eight clean sheets in about a dozen games. Cutrone's opening goal was masterfully worked, but Calabria's goal that put Milan up 2-0 was masterfully taken. The fact it came from a right-back who was confident enough to chip a goalkeeper like Alisson typifies the swagger with which Milan are playing. The media is gushing over Cutrone, but Calabria, in my mind, is more emblematic of Milan's resurgence. Cutrone has exploded onto the scene; while Calabria, after a stuttering start, has slowly eased into it, making that right-back spot his own, so much so that it is tempting to forget Andrea Conti. Calabria is a player who had obvious psychological frailties just like Milan did in the fall, and even now, in this period of upswing, he is prone to errors (his red against Udinese, for example). Understandable for a 21-year-old; understandable for a Milan side getting used to winning. But Gattuso handled that red card expertly, saying that it was a result of an ingenuita (naivety) in the youngster. It is the effort to understand his players in such a short period of time that has propelled Gattuso to where he is now. Last week he lamented how he hasn't yet managed to get in the head of Andrea Silva. After Milan's embarrassing 2-2 draw to Benevento, he said that it wasn't the time to raise his voice--it was a time for tenderness. But throughout Milan's success, never once has he taken credit, preferring to play the role that he is typecasted for: the snarler on the sidelines. 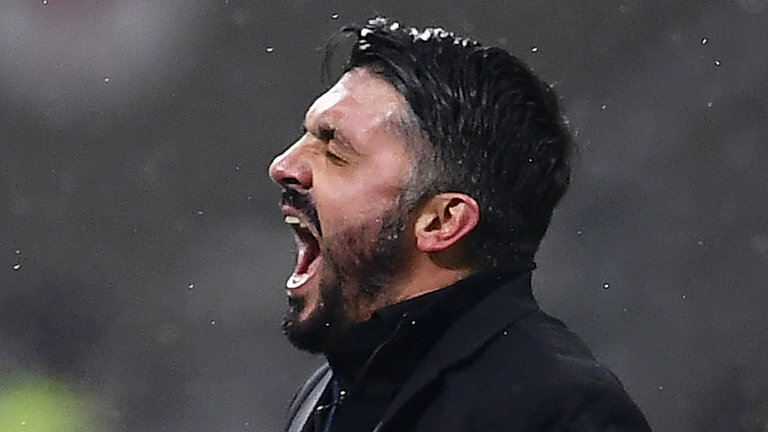 Gattuso's greatest strength, then, isn't grit. It is his self-deprecation, a self-deprecation that downplays his profound understanding of what this team needs. Gattuso is a paradox: on the one hand he trades in an excess of emotion, and on the other hand he is modest, circumspect, reserved with, and in the face of, praise. "Maybe I am the worst coach in Serie A," he said in December. "But I want to always win." He refuses to celebrate now. He refuses to take the plaudits. He refuses even to sign a new contract until the end of the season for superstitious reasons. But if his Milan side continue this extraordinary run, it will be more and more difficult for him to hide.